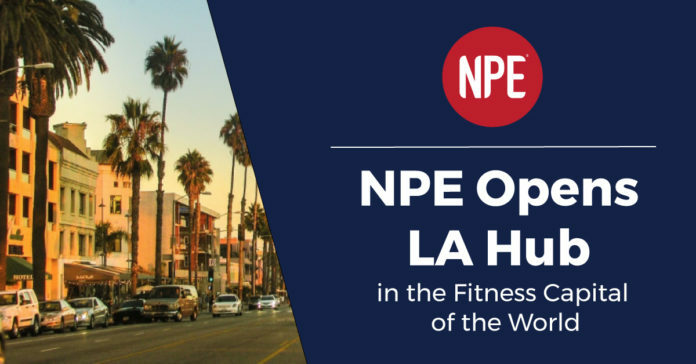 Leading fitness business coaching company, NPE, announces a Los Angeles office hub will be opening in February 2018, with the remainder of the company now operating fully virtual with existing hubs in the UK and Australia. NPE identified an exciting growth opportunity and desire to be in the heart of the fitness industry, surrounded by an increasing number of tech companies by relocating its US headquarters to Los Angeles, CA. In December 2017, NPE’s executive team made a unanimous decision to close its doors to the East Coast office location, Orlando, FL, the same city where NPE was founded back in 2006. NPE clients won’t be affected by the changes with their day to day contact. Seventy percent of NPE was already operating in the virtual space. This smooth transition was made possible thanks to NPE’s heavy investment in moving to Agile and SCRUM methodology over the last year; that made work more transparent and allowed teams to increase their productivity. “As we continue to bring on leading methodologies for the way we work, we are increasing our innovation and velocity as a company. Our teams are bringing more solutions to market for clients to solve problems faster while achieving bigger personal and professional goals. That’s the reason why we do what we do,” said Greeley. L.A. accurately claims fame to pioneering the fitness industry in the mid 60s thanks to gyms such as Gold’s Gym and Muscle Beach in Venice. Now over 50 years later, L.A. continues to redefine the fitness industry through personalization and innovation which aligns with the values and vision for NPE to continue to lead the way for business coaching. “There’s a strong fitness community outside of the parameters of the gym walls and unrivaled experience. L.A. and California are filled with world class coaches, personal trainers, programs, group exercise instructors and business owners who lead the field. I’m excited to be a part of all the action 24/7 with this L.A. move and share that knowledge and passion with our clients all over the world,” continued Greeley. NPE’s L.A. hub allows for a closer proximity to the existing client base, thanks to the greatest concentration of NPE’s partners and clients in the U.S. being based on the West Coast as well as access to direct flights from LAX to Sydney and London, which makes NPE’s new L.A. hub geographically more central. In addition, NPE’s large annual conference #MegaTraining, which has traditionally been held on the East Coast each year, will now be moving to the West Coast. More details regarding this event will be released in the next few weeks. NPE remains confident the L.A. relocation will be an even bigger drawcard for participants wanting to network and invest in their personal and professional growth and business development at this event.